Send us your photo...and we'll turn your Memory into a Masterpiece on Canvas! Digital Painting: Can computers create a painting? Shop around the web and you'll see plenty of offers for digital painting and artworks created by computers. “My Photo to Painting” done by a Computer? A Mona Lisa on the MAC? Really? First, it depends on what you mean by “painting”. 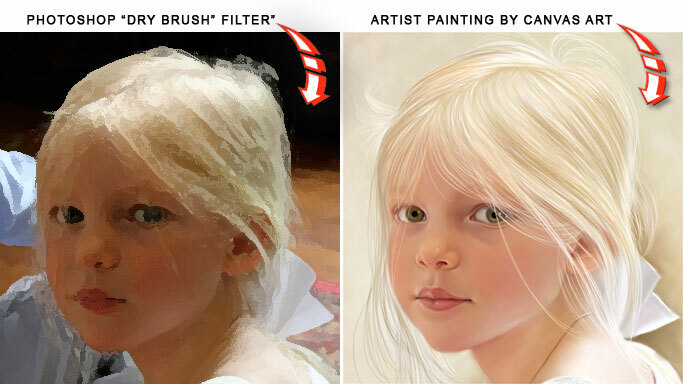 If you're talking about the time honored techniques for traditional portraiture…ie: portrait painting with a brush in the classical style like Picasso or Rembrandt, then….No, computers cannot paint. And in this respect it is almost certain they never will. As it turns out there are too many creative decisions for the Artist to make. Lighting, choice of color and the difference in texture between hair, skin, clothing and background are but a few of the challenges computers and their inherent software programs would find difficult to overcome. But it's more than that really. The famous master Henri Matisse once said “I do not literally paint that table, but the emotion it produces upon me.” Real Art, the kind that moves the soul, is a unique form of Human expression. Computers, on the other hand, are essentially Robots. They can only do what they're programmed to do. But there are some things in the Art realm for which computers are very well suited. We've all heard about PhotoShop. This is the popular software program installed in a computer which photographers and graphics arts professionals use to change the way images look – including images of people. Don't like wrinkles in your personal photo? No problem. Think you're too fat? No problem. Tools in PhotoShop can edit all these things in a snap. Its an amazing computer program to be sure. PhotoShop also has a built-in feature (or filter) which claims to offer painting effects. Are they any good? Look at these images and you decide. The image on the left uses the PhotoShop “Dry Brush” filter. This is the best simulation PhotoShop can offer in an attempt to create a painted artwork. It's the same or similar effect to what most web based service providers offer (you know, websites whose primary business is the printing of photos on canvas). In contrast, the image on the right is a hand painted digital artwork created by a Human Artist at Canvas Art.com. The portrait was created using a professional drawing program such as Corel Painter. The Artist (again, a Human) has 25 years experience in fine art portraiture and 10 years experience as a digital painting artist. You'll notice the Human Artist made a choice to remove objects from the photo background (the arm of the little girl's brother and the wood floor) and lightened the skin tone considerably. The computer (via the ‘dry brush' filter in PhotoShop) does not discern poor lighting in the original photo and attempts to paint everything in the image without evaluation as to whether the background is artistically important or not. So much for the Robots, right? 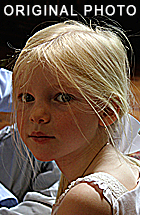 To see your photo turned into a painting visit Canvas Art.com and select the $10 Preview offer. For this fee a professional Artist will create a painting based on your photo and send you a proof by email to review in advance of any decision to purchase. © CanvasArt.com. All Rights Reserved.